DeShawn Dumas, a cousin of David Josiah Lawson. Two students stood alone in the middle of the Arcata Plaza in the pelting rain, redirecting mourners. 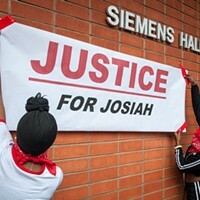 Due to the weather, the vigil and memorial for David Josiah Lawson, a Humboldt State University student who was killed on April 15, 2017, was moved to the D Street Neighborhood Center near campus. 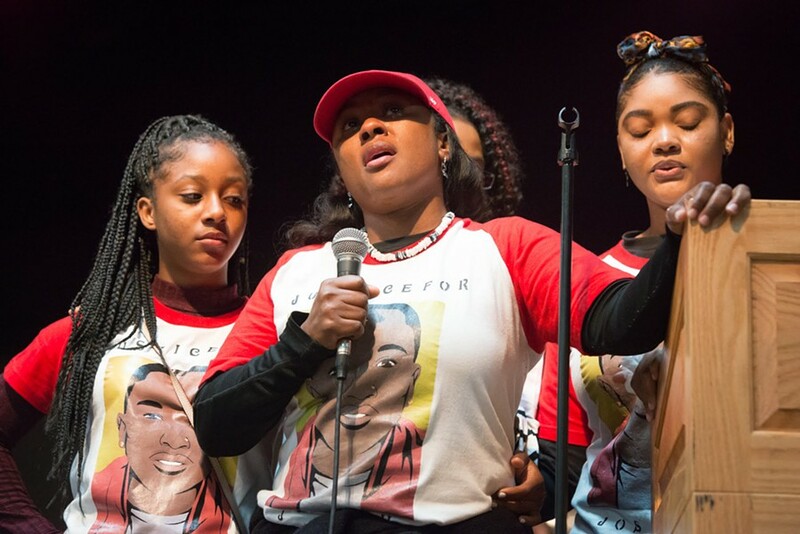 By the time Charmaine Lawson, David Josiah's mother, took the microphone, the room was filled beyond capacity, with hundreds of people sitting at the long tables, squatting in the aisles and standing, backed up to the room's double doors. Outside, the HSU Marching Lumberjacks practiced in the rain, the muffled sound of the tuba precipitating Charmaine Lawson's words. Fitting for a celebration of life, the crowd was jovial, exchanging hugs and hellos as children played in a bounce house erected inside. Lawson and Lorna Bryant, who emceed the proceedings, had to shout for quiet. Charmaine Lawson began by saying hello, then pausing to lean her head back as though to still a sob. One year ago today she was sleeping downstairs on the couch at home when she received a call from her eldest son's cell phone. It was 3:27 a.m., and one of DJ's friends had called to say he had been stabbed and was at the Mad River Hospital. "Today is a day we are celebrating his life but I wish we didn't have to," she said. She described the anxiety of that night as she made phone calls to the hospital and to her sister, trying to get to her son. When she recounted the moment she learned her son had died from his wounds, she stopped and buckled forward, her voice becoming a wail. Her daughter and cousin, next to her on the stage, grasped her shoulders in support. But Lawson regained her strength as she talked about her son's many accomplishments, the first of her three children to enroll in college. "We are still proud of DJ Lawson," she said. The audience applauded. 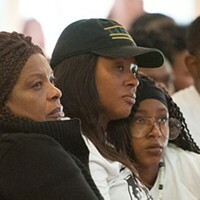 Charmaine Lawson (center) stands with her family. 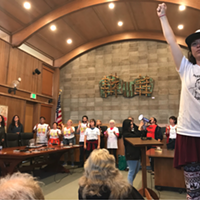 She then shared with the audience why she continued to travel back to Humboldt County each month, giving her love and appreciation to the students at HSU and College of the Redwoods, as well as various community members and city staff. "Humboldt County, I thank you," she said. "I appreciate you for being with me for the last year." She also expressed her love and empathy for the family and friends of two students killed in a car wreck near Miranda on Friday morning. The students, she said, were two friends of her sons who decided not to be at the memorial because it was too sad for them. As she spoke, many students in the audience wept. Lawson's address to the community was followed by a short speech by Pastor Roger Williams of Eureka's Seventh Day Adventist Church, who prayed for healing. 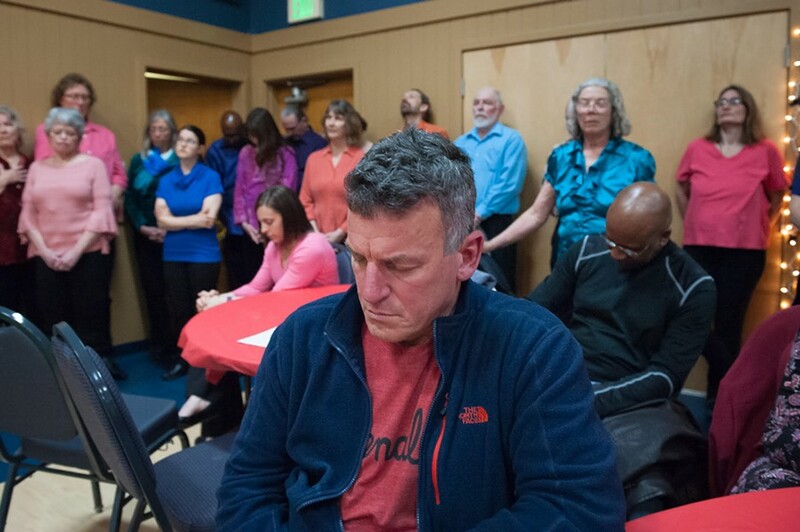 As volunteers pushed the tables together to accommodate more people, the Arcata Interfaith Gospel Choir sang. 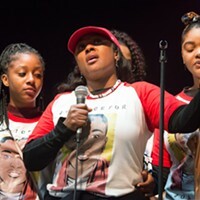 Lorna Bryant, who hosts KHSU's Thursday Night Talk: Race Beat and has grown close with the Lawson family over the last year, called the anniversary of the student's death "overwhelming." "Emotions are heightened right now," she said, and expressed her admiration for Charmaine Lawson. "The most beautiful thing is to see her resilience. She's supporting this community. It's our duty to support her." 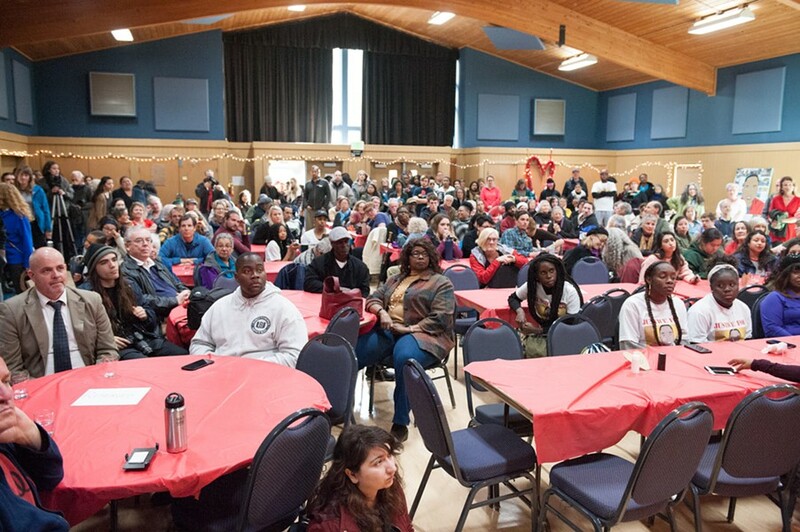 The packed D Street Community Center. A DJ took the place of the choir as dinner was served: grilled chicken, jerk chicken, macaroni and cheese, collard greens and vegan dishes. 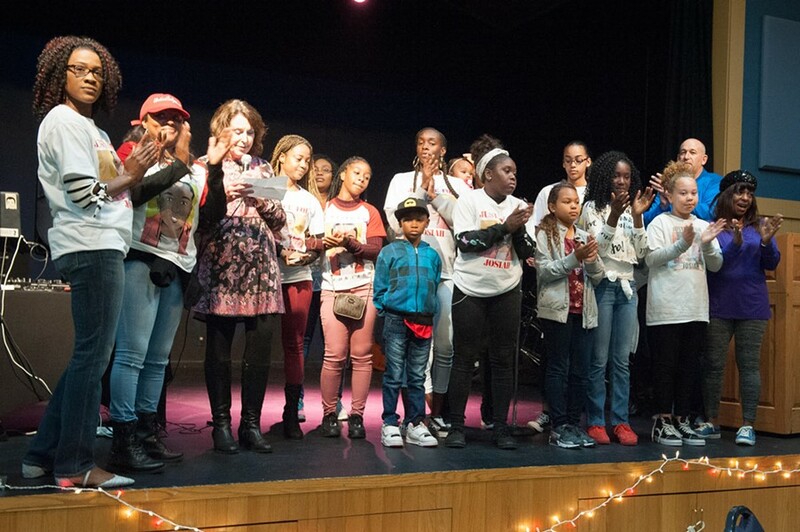 Several young girls took the microphone to call names from raffle tickets. All of the HSU and CR students were entered into a drawing for "starving student care packages" with cleaning supplies and snacks. Tina Okoye, a staff member with the HSU African American Center for Academic Excellence, said the care packages were part of an idea by Charmaine Lawson to provide resources for homeless people in the community, including students who experience homelessness. The supplies were donated by staff, faculty and community members. 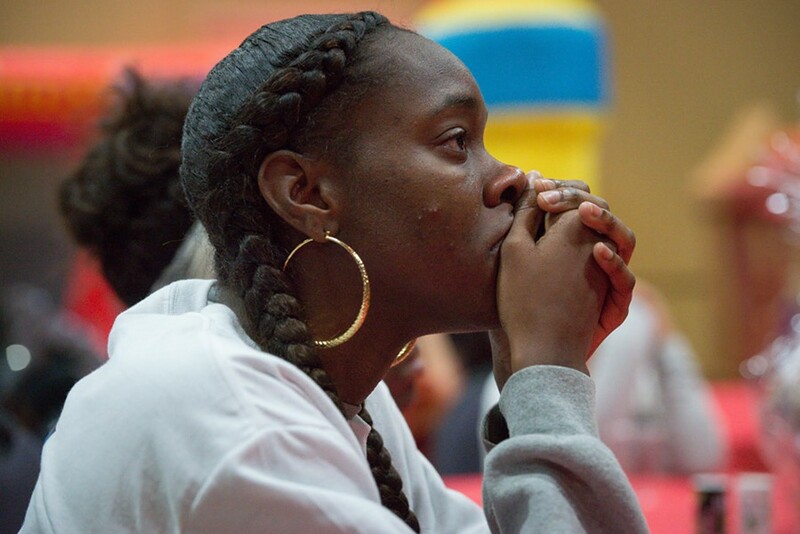 Okoye said it was important to help students of color feel supported in the community. "Allies can listen and be available," she said. "You don't always have to give input. Try not to be defensive." HSU campus police chief Donn Peterson closes his eyes during the prayer. As the crowd finished eating, Randi Darnall Burke, HSU's dean of students, announced that the university had decided to create a memorial grove on the eastern portion of the campus between the kinesiology and athletics buildings. The redwood grove will be "a place to celebrate the lives of those who were a part of the HSU community." 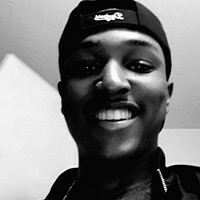 The first memorial will be in honor of David Josiah Lawson. 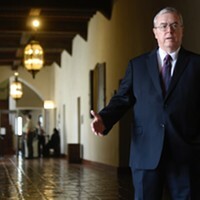 Lawson's death remains unsolved one year later, even as the investigation by local law enforcement has suffered a recent shakeup, with Arcata police chief Tom Chapman resigning the day after the departure of former FBI agent Tom Parker, who was assisting with the case. You can find more information about that development, and our recent coverage of the anniversary of Lawson's death here. David Josiah Lawson's extended family applauds during the announcement of HSU's memorial grove.